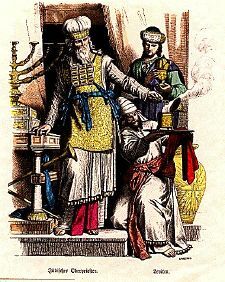 Abiathar placed at David's service the high priest's ephod, a sacred vestment as well as a device for divination, depicted here in yellow. 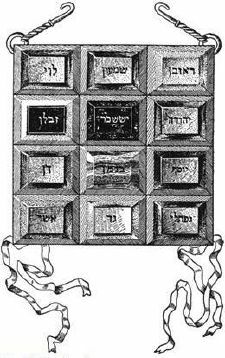 Abiathar (אביתר, Ebyathar—the father is plentiful), in the Bible, was the son of Ahimelech, the chief priest at Nob, in the lineage of Eli. The only person to escape from the infamous massacre of the priests of Nob by King Saul, Abiathar fled to David, bringing with him the sacred ephod, which he used on several occasions to provide David with crucial advice from God. When David ascended the throne of Judah and Israel, Abiathar was appointed high priest (1 Chr. 15:11; 1 Kings 2:26) along with Zadok. He was said to have carried the Ark of the Covenant before David and to have shared the king's hardships (1 Kings 2:26). He greatly helped the king at the time of the rebellion of Absalom, both spiritually and by providing military intelligence (2 Sam. 25:24-35). Late in David's reign, Abiathar became a supporter of the usurper Adonijah, for which he was deposed by Solomon and banished to Anathoth. With his demise, the lineage of Zadok emerged as the leading priestly clan. Abiathar's name may be interpreted in several ways, its component syllables meaning "father" and "plentiful" (or "pre-eminent"). The word "father" may refer to Abiather's own father, to Abiathar himself as the "father of plenty," or to God, the divine father. Abiathar's story is told primarily in the first and second Books of Samuel. It begins during the time when King Saul had come to view his young commander David as a threat and was seeking David's life. David came to Abiathar's father, Ahimelech, for aid. Ahimelech provided David and his men with consecrated bread and gave David the sword of the famous Philistine giant Goliath, whom David was said to have slain when just a boy. Abiathar was present at this meeting and was later conscience-stricken for not pointing out a likely spy for Saul, Doeg the Edomite, who was also there. David then went to the Philistine king Achish but was rejected by him. Sheltering in a cave called Adullam, David gathered a following of some 400 men. He then sought sanctuary with the king of Moab, leaving his parents in that king's care, but was advised by the prophet Gad to return to the lands of Judah. There, his general whereabouts were soon discovered by Saul. The king sought to bribe the neighboring tribesmen of Benjamin to reveal David's hiding place. None of them spoke up, but an Edomite by the name of Doeg, who had been a witness when Ahimelech helped David, was willing to cooperate with Saul. "I saw the son of Jesse come to Ahimelech son of Ahitub at Nob," Doeg revealed. "Ahimelech inquired of the Lord for him; he also gave him provisions and the sword of Goliath the Philistine." Saul immediately summoned Ahimelech and his entire extended family, the priests of the sanctuary at Nob, and interrogated them. "Why have you conspired against me, you and the son of Jesse," Saul demanded, "giving him bread and a sword and inquiring of God for him, so that he has rebelled against me and lies in wait for me, as he does today?" Abiathar was the only one to escape this horrific massacre. Fleeing to David, he reported the crime and David repented for his own failure in the matter. "That day, when Doeg the Edomite was there, I knew he would be sure to tell Saul," David confessed. He then comforted the young priest, saying "Stay with me; don't be afraid; the man who is seeking your life [King Saul] is seeking mine also. You will be safe with me." This was the beginning a long and usually fruitful association between the two. Although not described in detail in the text, Abiathar's ephod may have included the breastplate used by the high priests as a divination device. It is of particular significance that when Abiathar escaped Saul and came to David, he brought with him an item known as the ephod, a richly woven priestly linen garment. This particular ephod apparently included what the Book of Exodus calls a "breastpiece for making decisions." (Exodus 28:15) This artifact gave David a distinct advantage, for Abiathar knew how to use it to determine the will of the Lord. David immediately put this power to good use against the Philistines, learning by "inquiring of the Lord" whether, when, and where to attack (1 Samuel 23:1-6). Abiathar's ephod also provided David with intelligence in his struggle with Saul. "Bring the ephod," David commanded Abiathar. It informed David that Saul would come to attack him, and that David could not trust the citizens of Keilah, among whom he was hiding. David and his men quickly escaped, leaving Saul and his forces frustrated (1 Samuel 23:9-11). Later, David discovered that an Amalekite raiding party had destroyed the town where David had been living, Ziklag, carrying off its inhabitants, including David's wives Ahinoam and Abigail (1 Samuel 30). Once again Abiathar brought forth the ephod. David thus learned that God indeed wanted him to pursue the Amalekite raiding party, despite their having a three-day head start. When he did so, he was able to learn of the party's whereabouts from a captured Egyptian slave. David soon liberated his wives and took substantial booty from the Amalekites after killing them. Abiathar's help thus enabled him to send valuable gifts to the elders of the tribe of Judah, which would stand him in good stead with them. After becoming their king, David ruled the tribe of Judah from Hebron but was eventually able gain the support of the northern tribes, who had remained loyal to Saul's son Ish-bosheth, and to capture the fortress city of Jerusalem from the Jebusites. When he made the city his new capital and installed the Ark of the Covenant there, Abiathar apparently was in charge of carrying the Ark to its new sanctuary (2 Samuel 6:14-15; 1 Kings 2:26). In describing David's consolidation of power after defeating several foreign enemies, the biblical text identifies Abiathar as one of two high priests appointed by David, along with Zadok (2 Samuel 8) and perhaps others. Abiathar remained loyal to David during Absalom's rebellion, and it was he who offered sacrifices on the king's behalf when David was forced to leave the capital in the face of Absalom's advance. David commanded Abiathar and Zadok to remain with the Ark of the Covenant in Jerusalem, both to attend to their priestly functions and to act as spies for him. The two priests were soon able to secure valuable military intelligence for David and communicate it to him through their sons, an important factor in David's survival and eventual triumph over Absalom's forces (2 Samuel 15-17). Near the end of David's life, however, Abiathar found himself on the wrong side of the succession struggle. He and the military commander Joab backed Adonijah, David's son by his wife Haggith, while Zadok and the prophet Nathan supported Solomon, David's son by Bathsheba. While David clung to life, Abiathar publicly sought divine approval for Adonijah's ascension to the throne by sacrificing sheep, cattle, and fattened calves on his behalf and conducting a sacred feast in honor of his kingship. When these ceremonies were brought to David's attention by Nathan and Bathsheba, David immediately appointed Solomon as his successor and had him declared the true king. Still consuming the feast marking his own supposed rise to the throne, Adonijah was brought the bad news by Abiathar's son Jonathan. For his part in the conspiracy, Abiathar was removed from the high priesthood and sent to his family home: "Go back to your fields in Anathoth," Solomon commanded. "You deserve to die, but I will not put you to death now, because you carried the ark of the sovereign Lord before my father David and shared all my father's hardships." Adonijah and Joab, however, would soon be put to death by Solomon's henchman Benaiah. Abiathar's deposition was the sole biblical instance of the ouster of a high priest by an Israelite king, although such events did happen in Hasmonean times. It also brought to an end the priestly dynasty of Eli, which had begun at Shiloh, dating back before the birth of Samuel. The priesthood thus passed from the house of Ithamar (1 Sam. 2:30-36; 1 Kings 1:19). Zadok now became sole high priest. Had Abiathar refrained from supporting Adonijah while David still lived, Abiathar or his son Jonathan might have gone down in history as the first high priest of the Temple of Jerusalem, and his lineage (rather than Zadok's) would probably have long endured in that position. As it stands, he is remembered with honor for the important service he did in bringing the sacred ephod to David after the massacre of the priests of Nob, and for acting as God's true priest throughout most of the king's career. In his defense, Abiathar may not have known that David intended for Solomon to be his successor. However, by backing Adonijah's attempt to seize the throne, Abiathar placed himself tragically on the wrong side of history. This page was last modified on 23 January 2019, at 17:10.